Texas Tech has suspended its coach after receiving a "complaint from a player and his parents regarding [Leach's] treatment of the athlete after an injury." He won't coach in the Alamo Bowl. UPDATE: It's Craig James's kid. See below. 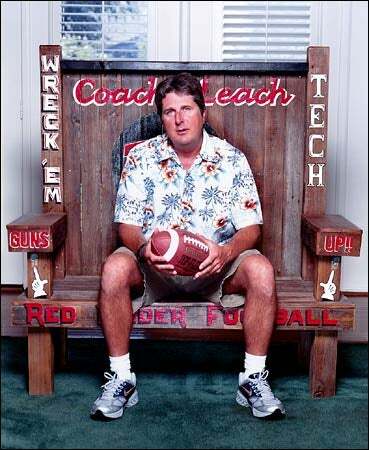 Texas Tech University recently received a complaint from a player and his parents regarding Red Raider Head Football Coach Mike Leach's treatment of the athlete after an injury. At Texas Tech all such complaints are considered as serious matters, and as a result, an investigation of the incident is underway. Until the investigation is complete, Texas Tech University is suspending coach Leach from all duties as Head Football Coach effective immediately. The investigation into this matter will continue in a thorough and fair manner. Coach Ruffin McNeill will assume duties as Interim Head Coach and will coach the team during the Alamo Bowl. The decision to take these actions was made in consultation with the Texas Tech University president, and the Texas Tech University System chancellor, and Board of Regents chairman and vice chairman. Because this is a personnel matter no further comment will be forthcoming. UPDATE: ESPN's Joe Schad reports via Twitter: "Mike Leach is alleged to have isolated a player in a dark closet for not practicing with a concussion." No surprise here. My dad talked this morning to Brik Brinker's parents who are some family friends of ours this morning at church and there could be an investigation at Texas Tech under way soon. Some of you know that I played football at Frenship High School in West Texas and the Brinkers are some of our family friends. Brik played at Frenship and is now at Texas Tech. Anyways, my dad asked if they were going to the Alamo Bowl and they said no, that Brik was left off the team (no surprise, hamstring pull) but he told my dad that Adam James , son of Craig James, had a concussion this year. Toward the end of the year he wasn't practicing and Leach was not happy. Leach made him walk around the practice fields every day all day during practice. Apparently Leach was pissed that James showed up at practice with sunglasses on and when asked why he was wearing sunglasses to workout. James said he was sensitive to light and the doctors instructed him to wear them due to symptoms of the concussion. Leach then instructed Adam James to take out all of the equipment in the equipment bins and sit throughout practice inside of them. He had to do this 2 or 3 times. (Those of you that are wondering, the equipment bins are big huge bins on wheels that hold footballs, towells, pads, etc...) Well The Pony Express caught word of this and wasn't happy. The NCAA was called and Mr. Brinker said that there was going to be an investigation coming soon. It wouldn't surprise me if Adam enrolled at SMU this next coming season. What a piece of sh*t. With everything Mangino went through at Kansas, Leach may not be safe. Who knows, don't shoot the messenger. UPDATE #2: Brooks confirms that the player involved was indeed Adam James, son of Craig. He also notes that Craig is scheduled to work the Alamo Bowl for ESPN. The James family understands that Texas Tech University has undertaken an internal investigation. Since this situation affects our son and since the investigation is on-going, it would be inappropriate for us to speculate or provide additional information. Mr. and Mrs. James took the step with great regret and after consideration and prayer to convey to the Texas Tech Administration that their son had been subjected to actions and treatment not consistent with common sense rules for safety and health. The James family believes this is a matter important to protect all the fine young men involved in Tech football and the University's reputation for developing and educating young men and women. Over the past year, there has been a greatly enhanced recognition of the dangers of concussions and the potential for long term physical damage to players. At virtually every level of football coaching, cases where children and young men have sustained concussions have generated serious discussion of the importance of correct treatment and diagnosis. The entire James family is supportive of the University and looks forward to a resolution of the matter. LAST UPDATE: Craig James is off the Alamo Bowl detail, "for obvious reasons," ESPN says.